“Dream Worlds: The Art of Imaginative Realism” (on view November 23, 2016 – March 12, 2017) assembles award-winning artists from around the country who play a pivotal role in the art of cinema, television, set design, 3D animation, gaming, and costume design—pushing the boundaries of contemporary realism through the guise of surrealism. Their creations are now a fundamental component of both the fine art world and the commercial art industry. This exhibition is certain to entertain and educate all ages with a journey through the art of imaginative realism, offering fantastic visions within the past, the unexplored future, and even the unseen present—a journey that may inspire viewers to explore their own creativity and storytelling ability through art. “Dream Worlds” is produced with CMA guest-curator and Canton native, Chris Seaman, an award-winning artist-illustrator. With thanks to the aforementioned Chris Seaman, I am currently participating in this show--my first in an actual civic museum. The broader world of Imaginative Realism is extremely varied still, and this show runs the gamut. Some pieces hold down one end being very whimsical, while myself and a couple others are holding down the more serious end of the fort. Both these paintings hanging at this exhibition, for the first and probably last time, since "Glossai Pyros" was sold to a collector before I painted the second piece, and is on loan for the exhibit. "Glossai Pyros II" is available for purchase through the Museum. Please contact them for details. On the eve of my solo exhibition in Seattle, I was connected with the guys at the Console Obscura Podcast, and recorded a segment with them which covers some of my early days, work with Magic: the Gathering, and my Hearts for Hardware series. It also included a full-throated defense of Mega Man vs. the often preferred Mega Man 2. Heresy. Head on over to Console Obscura and check it out. The guys were super cool, and came out to the opening as well. Some of you have wondered about prints from the Hearts for Hardware series. 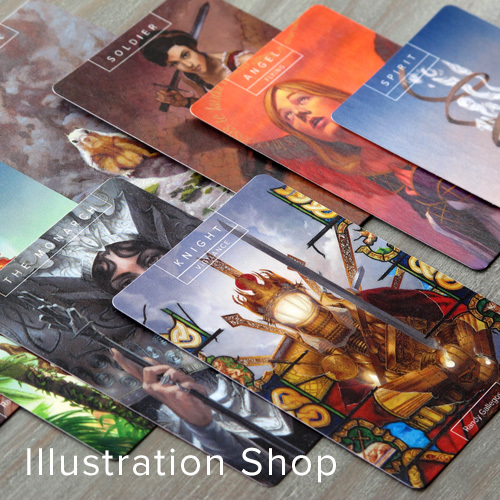 I did a few small Artist Proof runs in anticipation of larger releases and made them available at the show. I'd suggest you sign up for the mailing list for info on how to get in on these AP editions and their upcoming regular editions! Tags: Art Talk, Events, Fun, Hearts for Hardware, Misc. Friends, I'm happy to introduce you to a new side project I've been working on. It's a series of paintings called, "Hearts for Hardware." The genesis (ahem) of it was rooted in my dabbling with still life paintings the past couple of years, which itself was an outgrowth of having spent dozens upon dozens of hours working on my painting Alieis. One thing I've really enjoyed about still life painting is the way in which, as an artist, painting objects really causes you to see them for the first time again, in ways you never did, as I seek to document using paint. But, what is maybe more interesting is that once a thing is painted and hung on a wall, the viewer also experiences a change in how they view the object. The act of painting, and then framing and hanging as a work of art disrupts the way you normally view the thing painted in real life. Suddenly the viewer is also confronted with the object, perceived for its own qualities. If there are emotional attachments to the object, they are considered anew. Ever since I was very young, I not only played video games but also devoured magazines and the like devoted to games--and we're talking in the early 80s, before all the magazines most of you are thinking of. I was a fourth grader conversant on raster vs. vector-based graphics, I had a catalog in my mind of developers and what games they were responsible for, and many, many other geeky things. I should not know as much about old Japanese hardware that never made it to the west as I do. (L:) 9-year old me picked up this and other magazines at the grocery store. My mom was nice and let me buy them. They kept me occupied while we shopped at Alpha Beta. There were no mobile devices to distract your kids back then. I never owned even a fraction of all that was ever produced (but secretly I wanted it all), but I've been a gamer starting with those old black-and-white pong clones that had the games built into the controllers, then with the Atari 2600 and all the way through the generational history of gaming, stopping with the last gen as I have not upgraded to anything since--my backlog of games is so incredibly high that it seems futile currently. I'll be posting there regularly, and will maybe do some roundup posts here or as news relates, but I won't be muddying the waters here from my usual fare. I'll also report on new works in this series in my email newsletter, which you can sign up for at left. I currently have three other pieces up at the new site, so go take a look! The works presented will be on display and for sale as part of my solo exhibit, "Level Up," held at Krab Jab Studio in September. I'll be peppering the new site with new images between now and the show, and leaving a few for view there first. I hope you enjoy the series and that it also brings back as many fond memories as it does for me. Game on.